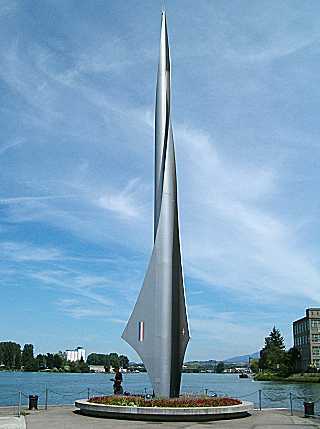 Switzerland as a landlocked country has no sea-ports, but an important share of imports and exports is transported on River Rhine. 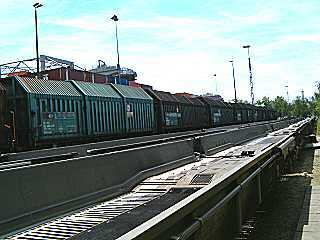 All four Swiss ports used for freight clearing are located in and around Basel: Kleinhüningen (Basel, right shore), St. Johann (Basel, left shore), Birsfelden and Auhafen Muttenz. 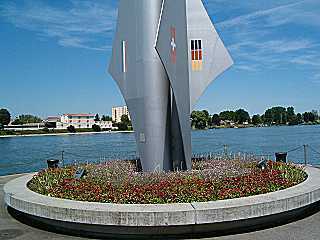 At the lower end of Rhine port Kleinhünigen a monument reminds of the good relations Basel has to neighbouring Alsace (France) and southern Germany. 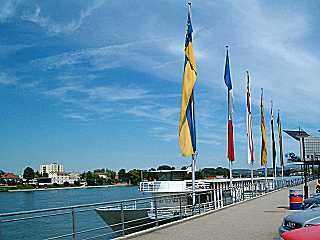 Basel is the only German speaking region in Switzerland with a clear majority of the population in favour of a membership in the European Union. 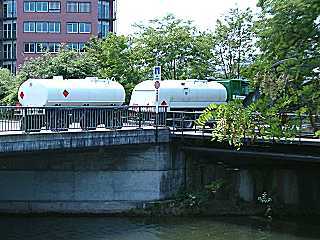 Dreiländereck is located at the end of Westquaistrasse. then follow River Rhine downstream. About 1/4 hour to walk. Birsfelden Rhine port is located upstream.